Hope your day got off to as bright of a start as ours did! As promised, here is a selection of interpretations on the duckling kit distributed by the Whetstone Library in Columbus, OH for the 27th annual Duckling Day Parade. What would you do with a brown paper bag and some construction paper?? Not pictured, Cora who preferred hugging the adults dressed in full-body duck suits than parading as one herself. Nearly half our group was absent yesterday for toddler art group at the Columbus Museum of Art, which was a bummer. But it worked out alright in the end because the kids who were with us were able to really spread out. Following opening stations, I read the kids a book called I Ain’t Gonna Paint No More! (Beaumont, 2005), a rhyming book with brightly colored illustrations about a little (gender-neutral) kid who gets in trouble for painting her/his body from head-to-toe. As I was planning for these gatherings, I read a few books about making art with young children, including Young at Art (Striker, 2001) which includes a 45 page bibliography of books about, or related to art concepts, for children. It could use an update, but I requested about twenty from the library and Cora and I have been previewing them at home. I asked her which of these she wanted to read with her friends in class, and she chose I Ain’t Gonna Paint No More! I brought a few others that address color mixing to inspire the kids to experiment with the paint I we’d use: Leo Lionni’s classic Little Blue and Little Yellow and Mouse Paint. 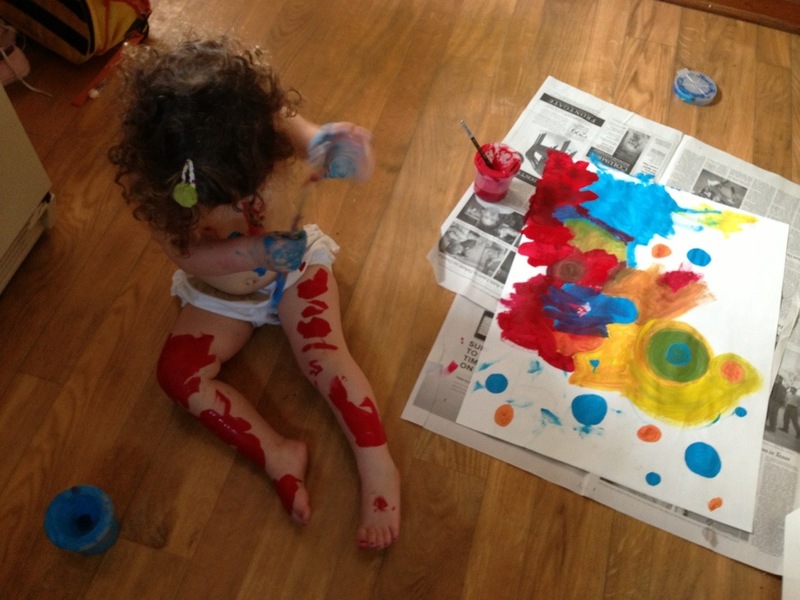 Like a lot of toddlers, Cora loves to paint her body as much, if not more than a piece of paper, no matter how the paper BIG might be. So, I was a little apprehensive about using this book in our art group. However, I came up with an idea that seemed to keep the paint off the kids’ bodies and on the paper, with the exception of Cora, of course! After reading the book, each parent traced her child’s body onto a large sheet of paper. Then, we passed around spill-proof containers of red, yellow, blue, and turquoise paint with long-handled brushes assigned to each jar. This kept the paints from getting too muddy and encouraged everyone to share so everyone could paint with multiple colors. The kids were engaged for a relatively long time and the end results are as varied as the kids’ personalities. More explanation to come, but in the meantime, enjoy this teaser. The library in my neighborhood will host its 27th annual Duckling Day parade this coming Saturday. It is one part celebration of spring, one part homage to the work of Ohio-born picturebook author and illustrator Robert McCloskey, creator of Make Way for Ducklings (1941). The history of the event here in Columbus is still a bit of mystery to me, though I know it was modeled after a similar parade in Boston that takes place on Mother’s Day and generates funds, through donations from the families who participate, for the public garden that is featured in the story. I have a call into our local historical society to try to learn more about how the event came to us. In the past, the parade has taken place around Easter, often in conjunction with the local egg hunt. Perhaps as a result, I didn’t pay any attention to it when George and Rosa were kids. I’m not big into pairing publicly sponsored gatherings with religious holidays. But last year, when Cora and I were still regulars at the library storytime and she was sturdy on her feet, I couldn’t help but get pulled into the event. All her little pals would be there, her community. 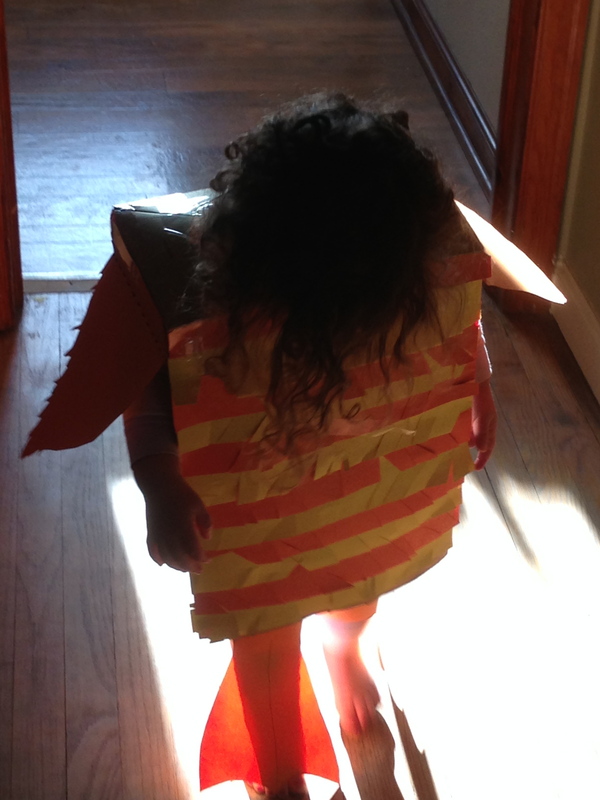 Early this morning we found ourselves on the kitchen floor surrounded by yellow and orange construction paper, scissors, tape, and glue as we made her costume. The papers were part of a kit we picked up at the library, all loaded into a brown paper bag that serves as the body of the costume. Just like last year. I completed that kit and Cora waddled her way around the library with hundreds of other kids, in a bag I decorated for her. But this year, she had a big part in the production and is so eager to participate that I had to hide the costume on top of the microwave, on top of the refrigerator so she couldn’t destroy it before the big event. A number of times in the past, Cora has sat and cut fringes on a piece of paper for a long time before she got up to do something else. I’m talking 20-30 minutes or so which can be an eternity in toddler time. It’s work she enjoys and she got to it without any prompting when I took out the paper and scissors this morning. 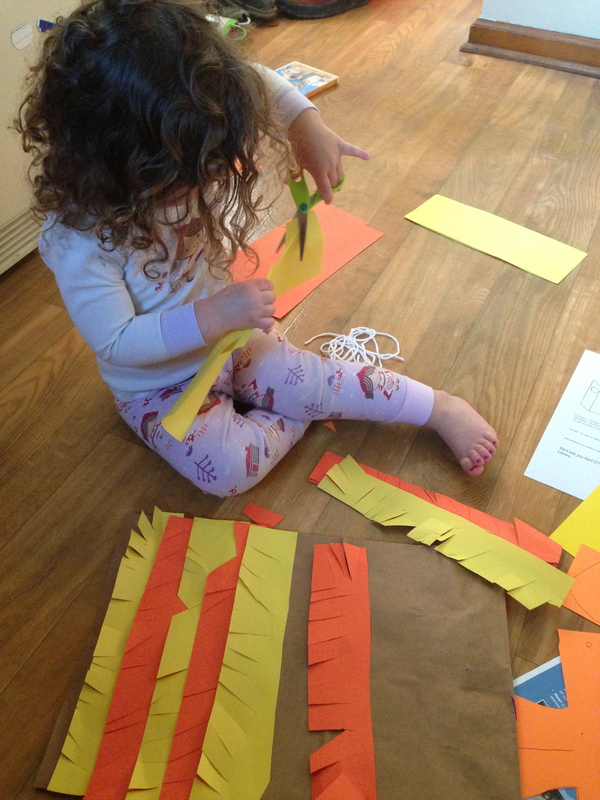 I gave her long, fat strips of construction paper and let her cuts her fringes around them. She loved working her way through the stack, talking excitedly the entire time. When she was through with a piece, she gave it to me, I cut it in half, and alternated glueing yellow and orange strips to the brown paper bag. I explained what I was doing to her and showed her pictures of her costume from last year. We didn’t create anything too original, but when I look at the rows or feathers, all cut to different shapes and sizes, I can’t help but smile. I see Cora’s handiwork in each and every slit. Of course, making a costume with a kit goes against much of what I write on this blog about not following a recipe when you make art with young children. But, as I wrote about in November, when it’s your own kid’s hand turkey, things get complicated. * In the case of the duckling parade, the custom kit seems to provide tight parameters out of which families devise many different variations. Last year I was amazed by the collection of ducks I encountered, each with a set of differently shaped feathers. I look forward to observing this again this year and promise I will share some of what I find with you. *(Note: This post was removed for publication review.) The library in my neighborhood will host its 27th annual Duckling Day parade this coming Saturday. It is one part celebration of spring, one part homage to the work of Ohio-born picturebook author and illustrator Robert McCloskey, creator of Make Way for Ducklings (1941). The history of the event here in Columbus is still a bit of mystery to me, though I know it was modeled after a similar parade in Boston that takes place on Mother’s Day and generates funds, through donations from the families who participate, for the public garden that is featured in the story. I have a call into our local historical society to try to learn more about how the event came to us. In the past, the parade has taken place around Easter, often in conjunction with the local egg hunt. Perhaps as a result, I didn’t pay any attention to it when George and Rosa were kids. I’m not big into pairing publicly sponsored gatherings with religious holidays. But last year, when Cora and I were still regulars at the library storytime and she was sturdy on her feet, I couldn’t help but get pulled into the event. All her little pals would be there, her community. Well, the best thing about an action research experiment like the one I’m currently involved with at the Columbus Museum of Art, is that we can do whatever we like. We have no firmly pre-determined agenda and no funders or academic advisors to please. All the participants are volunteers who are along for the ride, no matter the destination. But, we are answering to ourselves, and those participants are my friends and neighbors. I want them to be happy and satisfied with the time and energy they are putting into the venture. And I want the museum staff to feel they have learned something that might translate into programming for other families in the future. Last week I gave myself a few assignments, and this week I focused a bit on ways of addressing those objectives. 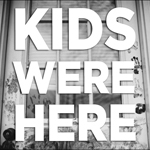 We got started with some stations, to maintain some continuity with the first session and to give people time to arrive, take their kids to the potty, and say hello, before moving up to the gallery. This week the homemade Play-Dough was the most popular station and it seemed like nearly everyone wound up at that table, together, which was nice. I brought various tools for making shapes – cookie cutters, old Perfection game pieces – since I knew we’d be looking for shapes up in the gallery. I also brought back the lightboxes with various shaped colored acetate and covered a large sheet of butcher paper with simple shapes drawn in black marker with crayons for parents and kids to add to. I am so glad we went to the gallery and I hope we’ll do it again – perhaps during our fourth and final session. Next week I have big messy plans. Even though I had a flashback to the day Cora did not sit down for a single moment in our music class, and nearly fainted when she landed a two-handed touch on the Color Field painting we were examining, it was truly grand to have this time with our friends in the gallery. While I strongly believe that museums ought to be conceived as a community spaces and sites for participatory cultural exchange, I still cherish them as spaces set apart from the rest of the world – shrines to artists, images, and objects. (I think I can trace this back to the first time I climbed the central stairs at the Metropolitan Museum of Art on a field trip in elementary school, but that’s a story for another time.) I think we feel and act differently when we are in a museum. As Dissanyake (1988) suggested, art is “making special,” and we feel special in relation to it. Our first venture into the galleries together was primarily focused on reading Perfect Square together in proximity to images that related to its content. 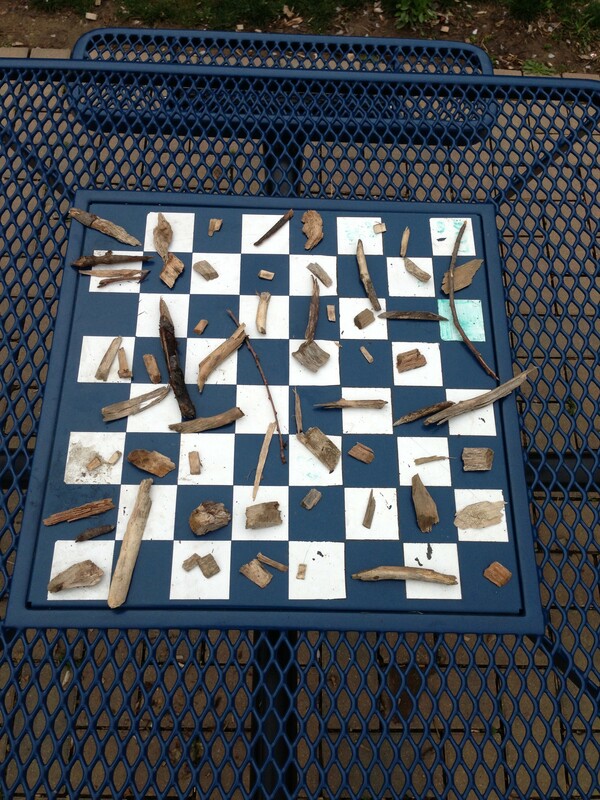 I’m sure if we had organized our time slightly differently, we could have carried that idea beyond the single work we looked at (by going on a square hunt, for example) but I know that such singular focus can be very effective for kids this age. I know, because on our way to the studio yesterday, Cora showed me the impact it can have. As we rounded a corner and entered a hall lined on one side with non-Western and folk artworks, she called out, “The dance!” and went running for a small ceramic sculpture from ancient Mexico. Backstory: About two months ago I took Cora and her gal pal to the museum and we looked at this “Figural Scene” together. I told the girls it looked to me like the figures were doing ring-a-round the roses and then we grabbed hands and did the dance ourselves a few times. Cora remembered it all. And as she did, she reminded me that it’s the quality, not the quantity of experiences that really matters. I think this is an especially important notion for parents of young children to keep in mind as we all try to offer our kids as many opportunities as time and budget can afford. Sometimes less really is more. That’s what I heard from a little girl, who later told me she would be 4 in July, as she went running from this table at one of our local playgrounds the other day. It was just after Cora and I arrived, so I didn’t get to see her at work, but I had to go over and investigate. Using wood chips and sticks of various sizes, she created this composition that any process artist would be proud to call their own. The best part, when she was done, she got up and ran off with no care for what might come of her work. The worst part, her dad was so busy tending to her baby sister that he didn’t even notice the masterpiece she’d made.